You may recall that I have a strange fascination with random ‘odd news’ stories; particularly ones on the subject of those objects which those children’s favourites the Wombles so eloquently describe as “the things that the everyday folk leave behind.” However everyday these folk are, they often end up leaving the oddest of personal possessions behind in some very random places, and that piques my curiosity. For example, you might remember that, back in January, I spent some time puzzling over how anyone could forget they’d left a full-size replica Dalek (no, really) in their hotel room (presumably on the ground floor…) after checking out, alongside a host of other decidedly random hotel housekeeping finds. I was reminded of that poor, lonely, abandoned Dalek earlier this week when I read about a new exhibition on a related theme which has just opened at the KK Outlet in Hoxton. 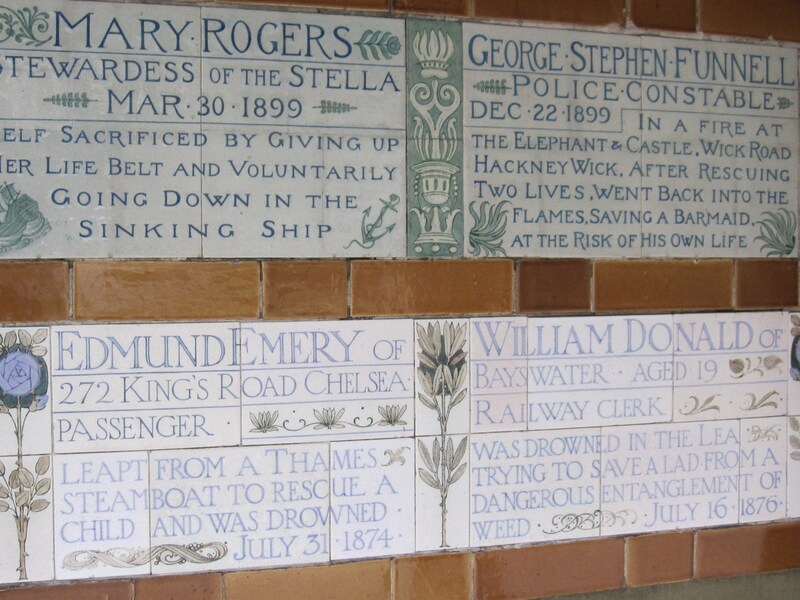 Running until 30th June, ‘The Lost Collection’ brings together an intriguing selection of artworks which are quite literally lost property – art that has been left behind, unclaimed and unloved, on London’s public transport network. Happy New Year! And as a special New Year’s treat, here’s another photo of some of the fascinating and excellent underground art displayed under the Westway in London’s Ladbroke Grove last month by the Mutate Britain team. Bringing us street art, grafitti art, kinetic sculptures, modern mosaics, poster art, paintings and photography from 130 different artists all working in different mediums and with different approaches, the One Foot In The Grove Winter Exhibition was far more fun, entertaining and thought-provoking than any normal art exhibition has any right to be (despite the freezing cold! ), and featured some art you won’t see anywhere else. This cute little fella is a… well, I’m not entirely sure what he is, but he’s definitely rather sweet, and he looks like he might be an environmentally friendly, low-maintenance type of pet too, seeing as he’s made of 100% recycled materials. He’d certainly be cheap to feed, seeing as his diet seems to consist solely of old drinks cans, and he probably wouldn’t need very much in the way of exercise. The perfect pet in many ways! 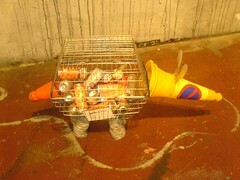 You can see more of my Mutate Britain photographs here, here and here. 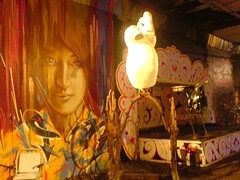 And if you want more information about Mutate and some great images of their art, check out the Mutate Britain blog. 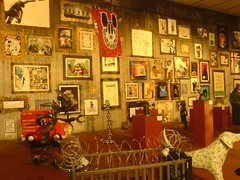 This image shows the far wall of the gallery room, which was used to showcase unusual, witty and though-provoking poster art, sculpture, photography and other objets d’art. However, despite initial appearances, this is not a conventional art gallery. There are no bored-looking security guards ensconced on plastic chairs, just ready and waiting to give you a good telling-off if you get a millimetre too close to the artworks. There’s no insistence on a pretentious dimly-lit hush being necessary for appreciating the art all around you. There’s no expensive catalogue, badly-written in incomprehensible arty-farty language, which leaves you even more mystified as to what it’s all about than you were in the first place. Instead, this is about the art, and about the people who make and who love the art. This is about democratising art, making it open to anyone and everyone, of any age and any background. This is about making art fun, making it an experience, about completely breaking all the conventional rules of art and art appreciation. This is about real art, and real artists. This is about taking art back to the people at long last. This is a very different sort of gallery. Watch out for more Snapshots from Mutate Britain over the festive season! If you want more information about Mutate and some great images, check out the Mutate Britain blog. Here’s a sneak peek at what’s going on under the Westway in London’s Ladbroke Grove right now. Readers with long(ish) memories will recall that I posted some photos of the One Foot In The Grove art event back in October, when it was first on. And now it’s back, with some exciting new art, in the run-up to Christmas. And keep an eye out here for more of my photos! 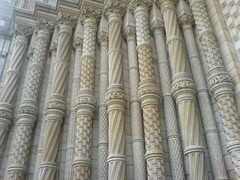 These amazing columns are part of the main entrance to London’s famous Natural History Museum. I visited today, for the first time since childhood, and found that it was much as I remembered inside. The dinosaurs are still as cool as they were when I was little and the mighty blue whale is still one enormous creature (although it didn’t seem quite as big as it did when I was small…). However, I had not remembered how intricate, highly textured and downright trippy some of the museum’s external architecture is, and found myself staring in fascination at these columns while school kids and tourists milled around me on the steps. I doubt the architect was on anything stronger than a cup of tea when he designed these candy-canes in stone, although the end results would suggest that it might be reasonable to suppose that he was somewhat away with the fairies. Whatever he was trying to achieve, he certainly let his imagination fly free, and the architecture of London is all the more fun for his efforts. What’s the story? – If you’ve ever been to Tate Modern, you’d be forgiven for thinking that this photograph shows yet another strange modern art installation of the type that gallery seemingly has an endless supply of; maybe some sort of mysterious blue grid light sculpture on a jet black background, executed in a stark and simple industrial style, possibly symbolising something profoundly deep or weirdly philosophical or completely nonsensical (or all three), and probably worth a not so small fortune should its up-and-coming creator really become an art world superstar. I would not have been at all surprised if you had guessed something along those lines. That would have been a good guess – but you’d have been wrong, because this photograph actually shows something just a little bit more ordinary and mundane than that. But only just a little bit. One Foot In The Grove – Art for people and place! UPDATE: One Foot In The Grove will also be open this weekend – October 30th and 31st and November 1st – come down and check out the new art that has recently been added! In a small corner of west London, just round the corner from Ladbroke Grove tube station and under the Westway flyover, a group of renegade artists have put together one of the most fun, original and thought-provoking art events I have been to in a very long time. If you find yourself in the area later today (18th October), or Friday, Saturday and Sunday of next week (23rd-25th October), and if you’re into street art, mad sculpture, graffiti, poster art, witty and original paintings and photography, fascinatingly insane installations, projections, film, good food, good tunes, friendly people, and a licensed bar, then make an effort to head down to Acklam Road, W10 and see what the good folks of MuTATE BRITAIN are up to. MuTATE BRITAIN’s new event One Foot In The Grove is open from 2pm to 10pm on Friday, 1pm to 10pm on Saturday, and 12pm to 9pm on Sunday, and is in the open air, quite literally under the Westway. Compared to the expensive exhibitions in the galleries up in town, entrance to this is a veritable bargain – only £1 before 6pm and £2-3 after then. I very much recommend you take an afternoon to check it out before the final day! In the meantime and if you can’t wait to see it all, you can check out this selection of exclusive photos, snapped by yours truly on a late Friday afternoon visit. If you’re inspired by all this amazing and diverse art, or you’re just simply curious, and you want to know more about what’s really going on under the Westway right now, then check out the links below for all the details. Meanwhile, have a look at all this….